Strategies determine how your listings will be repriced on the marketplace. You can choose to create a custom strategy which gives you access to all the settings we offer or get started fast with one of our pre-configured or algorithmic strategies. We will never go below or above your min/max price set parameters. Below are our strategy types offered for Walmart items. Important: Compete with Featured Merchants strategy applies to the Amazon marketplace only. Get the Buy Box (Algorithmic): This algorithm will identify the Walmart Buy Box seller specifically as your direct competitor and reprice you under the Buy Box price to ensure you always have the lowest price. Compete against the Lowest Price: We will pull in the lowest priced offer on the offer page as your direct competitor. You will have the option to set your own pricing rule of how you would like to be repriced by either dollar amount or percentage. Custom Strategy: Start from scratch and build your own strategy. You'll have the option to compete directly against the Buy Box or against the lowest offer on the page along with access to our additional exclusion settings. Use Max Price: Your max price will be used until the competition is recognized. 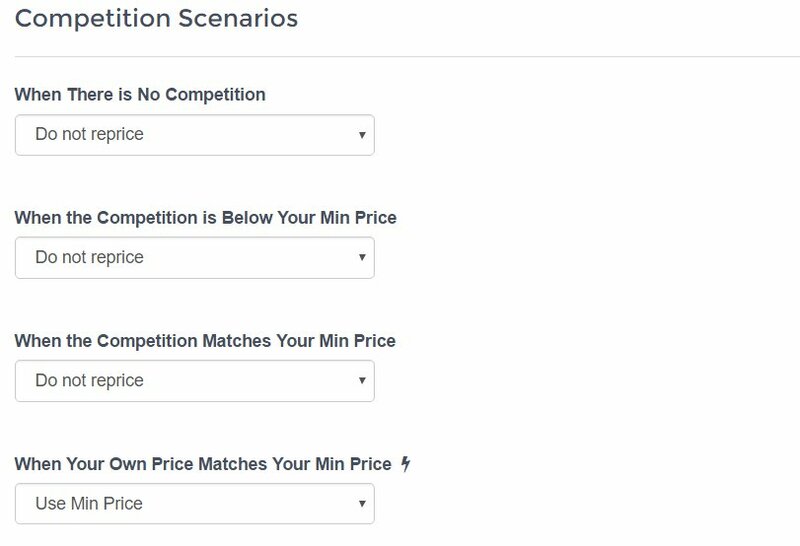 Your min price will be used until your competitor's price goes above your min. Note: If you also have an Amazon marketplace we will display: Only FBA, Only MFN, FBA then MFN, and FBA then Buy Box as options as well. Only ALL and Buy Box apply for Walmart. The Don't Lower my Price option overrides any settings that call for your min price to be used once you display Buy Box ownership in your account. The "Use Max Price" setting will continue to be followed. This option is ALWAYS used when Get the Buy Box is enabled.